When a customer gives you their email address, they’re highly engaged and eager to hear from you. But, if you wait too long, you run the risk of the customer forgetting they signed up. Even worse, they may have already spent their money at another business because they forgot about you. Learn how to avoid this costly mistake by creating an automated welcome series that goes out whenever a new contact joins your list. Use this worksheet to help plan your own Welcome Email Series. Want more email marketing advice? Subscribe to our newsletter! 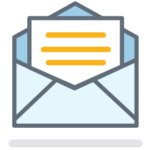 Our Hints & Tips newsletter delivers our best email marketing tips, tricks, and advice to your inbox twice each month.